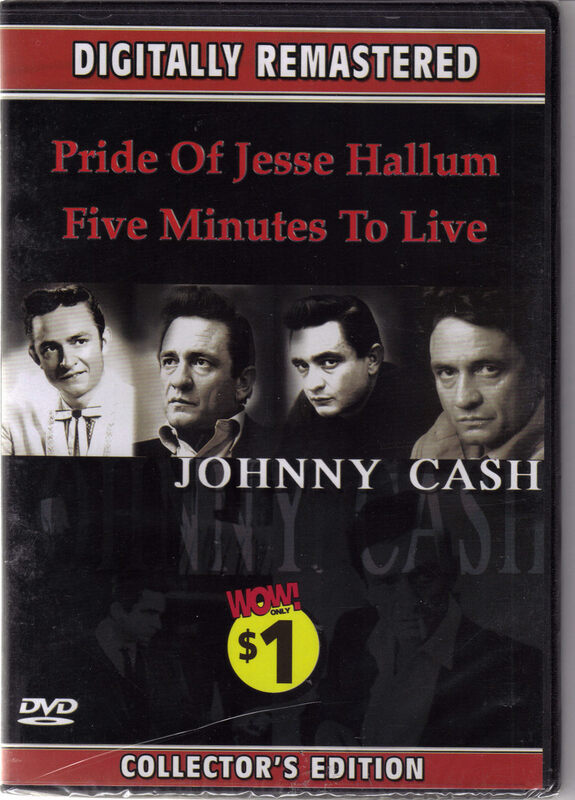 This is a Digitally Mastered DVD from The Treasure Box Collection of JOHNNY CASH: Pride of Jesse Hallum and Five Mintues To Live/Door-to-Door Maniac. Pride of Jesse Hallum is the story of Jesse Hallum (Johnny Cash), a coal miner from the age of 14, who has recently been widowed and is facing change. A proud man, Jesse is forced to confront his illiterary when he and his family move from their Kentucky farm to the big city in Ohio. Runtime: 105 minutes. Five Minute to Live: (Also known as Door-Door Maniac) Country star Johnny Cash stars in this tale of a kidnapper who takes a housewife hostag and demands a ransom from her wealthy husband. Runtime: 80 minutes Brand new. Plastic packging has little tear on one side but unopened. Measures 7-1/2" L x 5-1/4" W x 1/4" Thick Send email if you need additional details. Buyer is responsible for 1.95 shipping to anywhere in the USA Canada. Send email for international shipping rates. Do check the store for many more intereting collectibles daily. Thanks for stopping by!